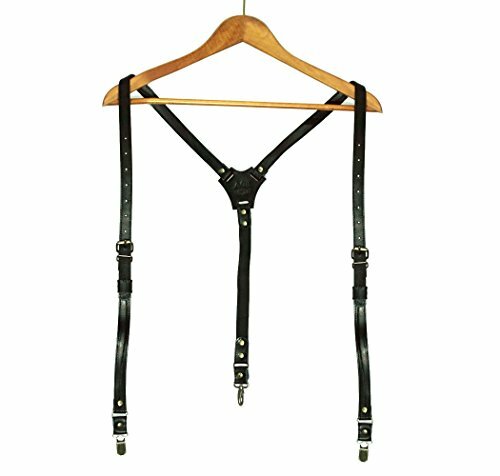 We're proud to present premium quality leather suspenders made by AGE. It is made of natural, top notch quality Italian leather. The straps are double layered, color will not bleed to clothes even with white shirts. Straps width is 2 cm. (0.7 in.). Perfect stitching, great leather and good hardware makes this product really durable. The length of the straps is adjustable and will work for everyone (up to 195 cm. tall / 6'4"). The back strap is made of elastic thus it is comfortable to move. In addition you'll get all 3 types of replaceable fastenings as displayed on photos and wonderful branded gift box! This product is ideal for wedding or as a gift. If you have any questions about this product by AGE, contact us by completing and submitting the form below. If you are looking for a specif part number, please include it with your message.